In 1992 we heard about the needs of the children and staff at this home which was begun in 1950 by the Rev Matthew Rusike. Our first contribution was to help finance a security wall, and later that year to send rice and beans following a disastrous drought. In January 2006 the inaugural meeting of The Friends from many parts of the U.K.was held and since that time has contributed, mainly cash, to provide 80% of the daily expenditure of the Home. Staff wages (when paid ) come from Zimbabwean fund-raising projects. Here in Surbiton we give a grant and hold a yearly fund- raising event. 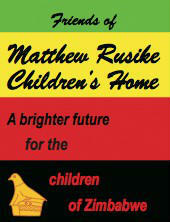 The web-site www.friendsofmatthewrusike.org has a wealth of information, some delightful photos and news regarding volunteering.